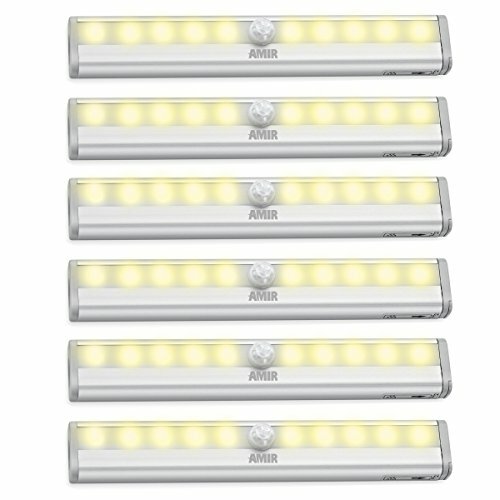 - NO WIRING REQUIRED: Use this under cabinet led lighting with the provided screws. ●Please kindly check if the batteries have been installed in the correct direction. There is an instruction label to prompt you this information. ●This light can only be turned on in darkness environment. ●Please DO NOT install 2 lights too close. One of them effected by the other may not work. 10 LED & Super-Bright: With 10 LED in each light, AMIR motion sensor lights provides enough light to make sure you never stumble in the dark. Fantastic energy saving and environmentally friendly ensure an extra long life for your light.